Wearing Ray-Ban Wayfarer sunglasses makes a cool, confidently retro fashion statement. Wearing oversized sunnies is bold and playful. Put the two together with Wayfarers and it’s a knockout look. So how do you bump up the size of Wayfarers to make a striking, classic style even more eye-catching? You’ve got plenty of options. First, let’s take a moment to appreciate the classic look before taking it XL. 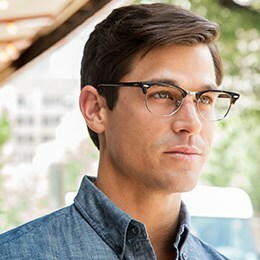 The familiar Wayfarer’s frame was designed by Ray-Ban designer Raymond Stegeman in 1952. Initially, the glasses had a slight cat-eye shape before quickly evolving into the unmistakable trapezoid outline well known and beloved today. Their mid-century modern vibe made the style an instant hit. They were donned by both eminently cool and counterculture celebrities, such as Bob Dylan, Buddy Holly, and James Dean. After a lull in popularity in the 1970s, their starring roles in the movies The Blues Brothers and Risky Business in the 1980s brought them back from the brink of obscurity and they’ve since become a timeless accessory. Today, you can get your hands on Classic Wayfarers or New Wayfarers, which have a slightly more streamlined silhouette. The eye size of glasses (sunglasses or regular) is the measurement of the lens frame from the temple across to the bridge. The eye size is measured in millimeters, with the number generally found on the inside of the earpiece or bridge. It’s a two digit number between 42 and 60, with 42 being the smallest and 60 the largest. To get an oversized sunglasses look, opt for a pair closer to 60 and the overall lens frames will be bigger, giving you the mod, larger-than-life look. This is a tactic that works for both men and women, and it easy to achieve with the unisex Ray-Ban Wayfarers. The long-lasting and well-earned popularity of Wayfarers sunglasses has inspired many glasses styles by other designers that are similar in geometry to the original, but are not Ray-Bans. To get the look, with a slightly different vibe, choose extra large sunglasses with a trapezoid shape and thick curved arms. These Smith Lowdown XL sunglasses for men are a good example of the oversized look. As if the daring look wasn’t enough, oversized sunnies offer additional protection from the sun’s damaging UV rays. Small-framed sunglasses with narrow arms provide some protection, but they let more sunlight reach your eyes and the delicate skin around them. Oversized sunglasses do a better job of protecting your eyes and reducing sun damage to the area’s fine skin. The Wayfarer look’s wide arms also add to the overall sun protection at your temple. Keep in mind that Classic Wayfarers tip forward at an angle, letting more sunlight in from the top. New Wayfarers sit slightly closer to your face across the entire fame. Sunglasses of any size should always offer 100 percent UV protection that blocks both UVA and UVB rays. The key to styling oversized sunglasses is going big in a way that fits your face. Giant sunglasses can give some people with narrow or small faces a somewhat bug-eyed look. Oversized Wayfarers give you extra large style while complementing all face shapes, from oval to round to square. If you have high cheekbones or a wide nose bridge, opt for the ‘alternate fit’ Classic or New Wayfarers. Finally, if you tend to perch your sunglasses on top of your head, reach for the New Wayfarers. Classic Wayfarer sunglasses don’t work as well up top because of their forward angle. Oversized Wayfarer sunglasses are the style to reach for when you’re feeling a pull towards a traditional look with a hint of the unconventional. Ready to supersize your fashion quotient?